We all know and love flour as the essential ingredient in bread. But flour can also perform other functions, acting, as it were, as an assistant or auxiliary in the process of making bread. 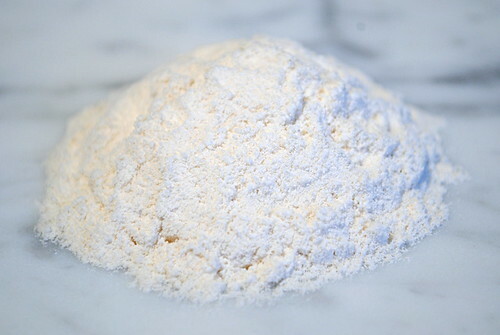 Most of the time, the support function of flour is as a non-stick agent. Dusting flour across your worksurface and hands, for example, makes it much easier to handle sticky dough. Although the obvious product would be more bread flour, there are other types of flour that do a much better job for certain tasks. Bannetons, brotformen and couche all need to be rubbed with flour to prevent dough sticking to them. Many bakers swear by rye flour for this purpose. Personally, I like to use rice flour. Rice flour is slightly coarser and grittier than wheat or rye, and it seems to cling more effectively than either. That’s particularly important when using coiled cane brotformen, as finer flour just falls to the bottom of the basket. Even so, I dampen my brotformen very slightly with water from a spray bottle before dusting them, which helps the flour stick. Don’t overdo it – just a single squirt should be enough. After repeated use, you shouldn’t need to dust the basket every time, as a layer of flour will build up on the surface, making it non-stick. Huge amounts of rice flour were once used by commercial bakeries in Britain, where it was known as cones, for reasons that I haven’t been able to uncover. In particular, it was used in thick layers on baking sheets to form rough moulds for small baked goods like rolls and buns; in this capacity it served double-duty by preventing the baked dough sticking to the surface of the sheet. Although non-stick coatings and materials like Silpat might seem to have made such measures unnecessary, plenty of bakers maintain tradition by using flour as a non-stick agent. Wheat and rye are not really suitable for this task, as they will tend to clump and leave streaks of raw flour in the underside of loaves and rolls. Rice flour is more effective because it doesn’t clump like finer flours do, thus avoiding this unpleasant effect. When it comes down to it, though, I prefer semolina. Semolina will be remembered by Britons of my generation and earlier as a milk pudding with the consistency of wallpaper paste, enthusiastically served by legions of school dinnerladies up and down the land. The base of this unhappy dish is semolina proper: coarsely-milled durum wheat. Durum wheat is the hardest of all the varieties of wheat, and is used also to make pasta and couscous. 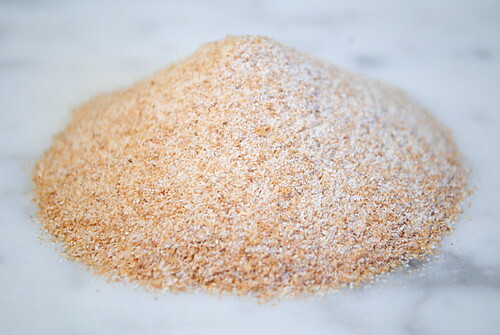 It has a much larger grain size than rice flour, with a texture much like fine sand. A generous layer of semolina on your baking sheet or stone will keep bread from sticking, and will give the base of your loaf a little extra crunch. Another alternative is corn meal. Ground maize (what we better know as sweetcorn) is even coarser than semolina, and is pale yellow. 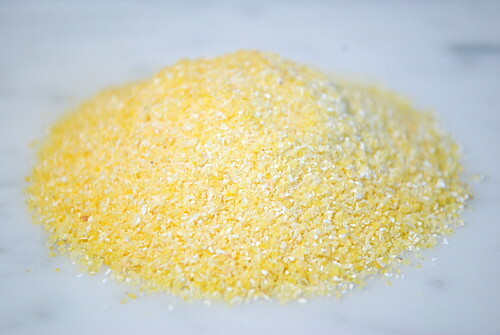 Corn meal is also used to make the Italian polenta, a peasant staple that has equivalents throughout the Mediterranean, as well as the chemically leavened quick-breads of North America, such as corn dabs. Wholefood shops are a good place to source these more obscure flours, although rice flour is more widely available as it is an important alternative to wheat flour in gluten-free baking. Of course, if you aren’t feeling the lack of these ‘assistant’ flours, you can do without them – but it is worth knowing about them, and how they can help you if you need it.